Located within the Richloam Tract of the Withlacoochee State Forest, the Little River Recreation Area is a remote destination with about 8 miles of multi-use hiking, biking and equestrian trails. Numerous small lakes and hammocks make this a great location noted for well marked, mostly shaded trails and scenic views - including a large number of majestic old-growth oak trees. Getting to Little River could prove to be challenging. From S.R. 50 east of I-75, access is by McKinney Sink Road or Porter Gap Road. Both are unpaved forest roads which may be challenging for passenger vehicles. McKinney Sink Road is probably your best bet ... but be prepared for slow going on the 3½ mile journey from S.R. 50 to the Little River trailhead. If you are not in a four wheel drive vehicle, proceed carefully and watch for soft sandy sections. If you're a city slicker, you should probably avoid this remote recreation area. Once at the trailhead, you will be in for an experience that is worth your effort in getting there. The network of loop trails are well-marked and mostly grass covered and wide, with plenty of headroom for horse riders. Judging from the tracks along the trails, it appears that equestrians are the primary visitors here. But the trails are enjoyable for hiking, and suitable for mountain bike riding. The loop trails at Little River are named the "Hammock Trail", the "Lake Trail", the "Magnolia Trail", and the "Oak Trail". Each takes you through different natural habitats. A number of connector trails allow you to plan your hike or ride for the length you want. 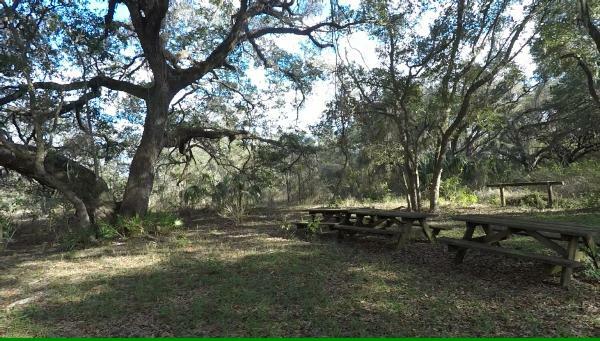 Be sure to stop by the picnic area located along the Oak Trail (shown as a dead end loop on the trail map) for a great place to rest, have lunch, and enjoy the scenery and lake views.